Pancreatic cancer develops when malignant cancer cells, which are abnormal cells with uncontrolled growth, occur in parts of the pancreas. 90% of pancreatic cancers arise from exocrine cells, which are pancreatic cells that secrete substances to help the digestion of food. The pancreas is a small gland, around 13cm long, located behind the stomach and joined to the start of the small intestine, called the duodenum. The role of the pancreas in the digestive system is to produce hormones that help regulate blood sugars and enzymes that help the body digest food. The pancreas has both an exocrine and endocrine function. Most of the cells in the pancreas are exocrine cells, which secrete enzymes that assist in the digestion of food. The endocrine cells are responsible for producing hormones such as insulin and glucagon. Pancreatic cancer begins in the lining of the pancreatic duct and spreads into the body of the pancreas. Cancerous cells can then spread further into the pancreatic blood vessels and nerves, blocking the bile duct. Afterwards, the cancer can also enter the lymphatic system and bloodstream and spread to other organs. Early detection and diagnosis of pancreatic cancer is difficult as there is a lack of characteristic symptoms during early stages of the disease. However, there are signs associated with pancreatic cancer that can emerge as the disease progresses to affect other organs. Symptoms may vary depending on where the cancer is located. For example, the yellow skin characteristic of jaundice occurs when a tumour blocks the bile duct. Jaundice, such as yellowish skin and eyes, pale bowel movements, itchiness of the skin and dark urine. 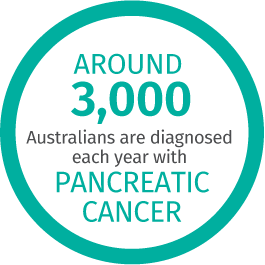 Around 3,364 people in Australia will be diagnosed with pancreatic cancer in 2018. In 2018, it is estimated there will be an average of 9 new cases a day and 8 deaths a day. Pancreatic cancer is more common in older age groups. The five-year survival rate for pancreatic cancer is 8.7%. The causes of pancreatic cancer are still unknown. However, some factors, which include lifestyle habits and certain medical conditions, can increase the chance of developing pancreatic cancer. A diet that has a high proportion of red meat, saturated fat and not enough fresh fruit and vegetables can increase pancreatic cancer risk. People who smoke tobacco are two to three times more at risk of developing pancreatic cancer. Pre-existing medical conditions such as diabetes, long term infection of hepatitis B and previous surgery, including the partial removal of the stomach or gall bladder. Chronic pancreatitis, the long-term inflammation of the pancreas, can increase risk five-fold. Long term heavy alcohol consumption can lead to chronic pancreatitis. Other inherited conditions that may affect risk include Peutz-Jeghers syndrome, Familial Atypical Multiple Mole melanoma, hereditary non-polyposis colorectal cancer and hereditary pancreatitis. To confirm a diagnosis of pancreatic cancer and to find out whether it has spread, your doctor will conduct several tests. Blood tests can reveal levels of a tumour marker called CA19-9, which is produced by some cancer cells, including pancreatic cancer. Blood tests can also show whether your kidney and liver are functioning normally. A biopsy may be conducted by taking a small sample of pancreatic tissue for examination under a microscope, to see if there is any evidence of cancer cells. Imaging technologies that scan the inside of the body can help doctors get a clearer picture of a possible cancer diagnosis. Abdominal ultrasounds MRIs (magnetic resonance imaging) and CT (computer tomography) scans can create three-dimensional pictures of the pancreas and surrounding organs to reveal how big the cancer is and whether it has spread. An endoscopic ultrasound may be performed to help find out if there are any small tumours in the pancreas.  A thin flexible tube with an ultrasound probe at the end is inserted through the mouth into the small bowel. The probe emits soundwaves which create a detailed picture of the pancreas. In some cases, an X-ray of the pancreatic bile duct called an ERCP (endoscopic retrograde cholangiopancreatography) can help diagnose in more precise detail the cause of any pancreatic blockages, which may cause some symptoms. The treatment for pancreatic cancer depends on the location and size of the cancer, and whether the cancer is in the early or advanced stages. The health and age of the patient will also impact treatment recommendations by medical professionals. When the tumour is in the tail or body of the pancreas, a distal pancreatectomy surgery is performed. If the cancer is large or in multiple places, there may be complete removal of the pancreas. For advanced stages of pancreatic cancer, removing the cancer may not be possible. The main form of treatment for advanced pancreatic cancer is chemotherapy. Other treatment options may include surgery or other procedures to relieve symptoms. This includes endoscopic treatment to insert a tube (called a stent) or double bypass surgery to relieve blockage of the bile duct. There is currently no standard or routine screening test available in Australia. Avoiding smoking or quitting smoking can reduce the risk of pancreatic cancer, as smokers are two to three times more likely to develop pancreatic cancer.